This article will help to understand how to alter databases properties using PowerShell V3.0 and SMO. 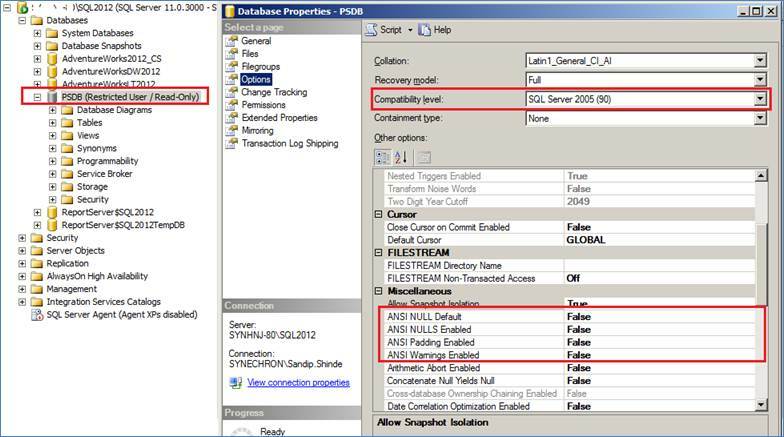 In previous article we seen PowerShell for Creating a Database. Basically we can alter database options from Automatic, Containment, Cursor, File Stream, Miscellaneous, Recovery, Service Broker and State Categories. Following PowerShell Script will help you to understand what I’m talking about. Following screen show is talking about the Updated Database Options during the execution of above PowerShell Script. You can browse this screen by selecting database properties and Options tab where you can notice updated Database Options during PowerShell Execution. Your blog is very interesting. You write about very interesting things. Thanks for all your tips and information. It’s an amazing piece of writing designed for all the online viewers; they will get advantage from it I am sure. a problem to light and make it important. A lot more people should read this and understand this side of your story. to send you an e-mail. I’ve got some recommendations for your blog you might be interested in hearing. Either way, great website and I look forward to seeing it develop over time. right. This submit actually made my day. You can not imagine just how a lot time I had spent for this information! leader and a large component of other folks will leave out your wonderful writing because of this problem.